Here in Arizona, we do have a winter season, even if it’s not what other parts of the country would consider winter. But as the nights begin to get a little chill, makes an evening outdoors more enjoyable than a fire pit. UNIQUE Landscape offers a full line of fire pits to meet any design style and fit even the smallest outdoor living spaces. You can select for any of the designs we show online or you can create your own custom fire pit when you meet with a designer for your free consultation. UNIQUE offers a variety of design choices from the traditional round fire pit to a more modern square and rectangular shapes. Your designer will be able to assist you in determining which shape fire pit will fit best in your outdoor living space as well as what size would be optimal. Smaller properties often cannot accommodate a large circular pit but there are many options for a long narrow fire pit which would provide a seating for a large group. 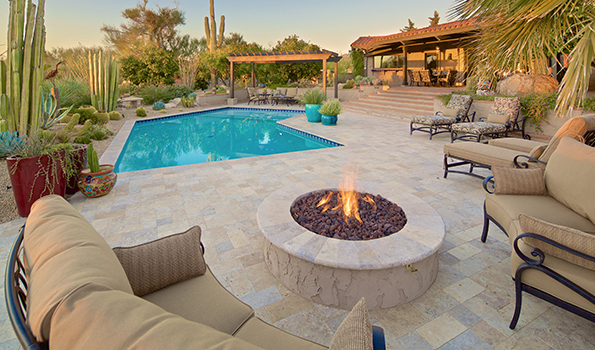 In addition, your fire pit can be finished in stucco to match your home, brick, stone or even tile. Call today to schedule your free consultation with a UNIQUE designer and learn more about your options for a custom fire pit to enjoy this holiday season.